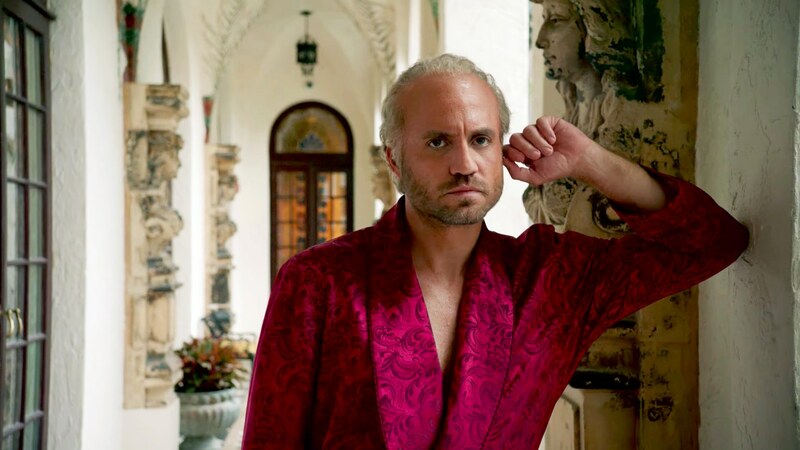 The Assassination of Gianni Versace isn’t your normal “whodunit” as we saw who did it, who he did it to and how he did it before we even saw the opening title. This series is more about what drove him to do it and how they caught him. So who did it? Blaine from Glee, that’s who. He’s ditched the blazer (and presumably Kurt) and has gone on a killing spree. Ok, it was actually Darren Criss playing serial killer Andrew Cunanan but I can’t help but feel that all that warbling drove him to it. Gianni Versace has no taste. Ok, perhaps that is a bit harsh. I’m not totally au fait with Versace (as he never did a line in Primark) but his style did seem a little gaudy. Infact his Miami home seemed to have been designed to look like a faux Italian Villa…which is a bit worrying as he really was Italian! But as I say, what do I know. Ricky Martin is still alive, bit living less of “la vida loca” and more “tennis coach”. He spent all of episode one in tennis whites (well, white and red as they were splatted with Gianni’s blood for most of the episode). Penelope Cruz plays Donatello Versace and judging by recent pictures of Donatello, that’s a win. I bet she’s chuffed. Saying that Penelope can’t hide her Latin origins mainly due to her amazing dark eyes and her wandering accent (which seems to have wandered over the Italian border to France, taken a day trip to Spain, acquired a lisp and returned to Italy). The police really cocked this whole thing up. In episode one we discovered that they knew who the killer was and has even been tipped off about his address (which was admittedly fake). As I said at the beginning, it was Blaine from Glee. All they did was have to stage a fake talent show themed around show songs and boom, they would have got their man there and then. The killer had bad glasses. I’m not sure if anyone has correlated the relationship between killers and bad glasses. Do bad glasses make you a killer or do killers just have an affinity for bad spectacles? I’m sure there is a grant out there to research this I expect the University North East Sussex’s Criminology department will put us out of our misery on this matter in due course. In summary then, by the end of episode one Gianni was dead (really dead, the camera did like to linger on the two big gunshot wounds in his head), Donatello is worrying more about the business than losing her brother, Blaine is on the run and the police are all over the show. I wonder if they will catch him? (If you want to save six hours of your life, just Google it, bit personally, I ‘m sticking with it, mainly to see if he gets any better glasses. Whilst you are here, we are trying to grow our little blog, so any shares, likes or subscriptions would be greatly appreciated. To receive updates from Shouting at the Telly, either subscribe using the buttons, like our Facebook page or follow us on Twitter. Thank you.